The 120V Rosco Mini-V Smoke Fog Machine hire delivers a powerful, continuous stream of professional-quality fog. The Mini-V fog smoke machine hire ‘s small design and energy-efficient, durable heat ex-changer make it an ideal choice for mobile users or applications that lack the space for a larger fog generator. Simple functions mean easy operation; you simply press and hold a button to make fog. The Mini-V smoke machine heats quickly and delivers a solid stream of fog, triggered by an on/off rocker switch. This light-weight fog machine hire is easily transported to any location that needs a professional-grade smoke machine hire – making the Mini-V fog machine ideally suited for photographers, mobile DJs, and event planners. The Mini-V fits comfortably into standard duct work, making it applicable for industrial use, such as HVAC testing. 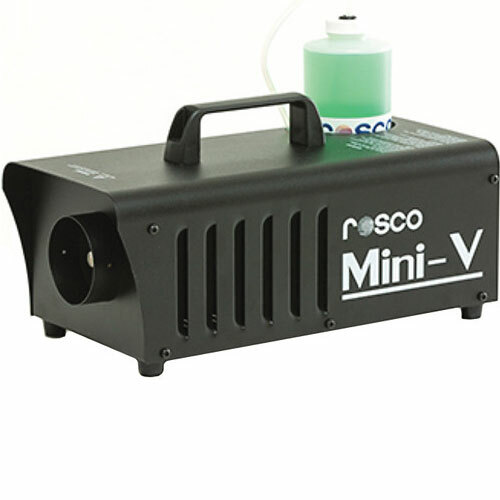 Rosco Mini-V Smoke Fog Machine is available for rent or hire from RENTaCAM Sydney.